Illumina, a UV LED retrofit system from Fujifilm North America Corporation, Graphic Systems Division, Hanover Park, Illinois, converts any traditional UV or waterbase flexo press to UV LED curing. Patented LED technology delivers up to 44% more energy toward the substrate, resulting in faster curing. The design of Illumina takes full advantage of the latest LED ink technology, including the Fujifilm 300 Series flexo ink system that performs equally well under UV LED or conventional UV-arc curing. The UV LED cure is an instant on/off process, lowering the energy usage and stress on lamp bulbs experienced in conventional always-on UV mercury lamp curing. 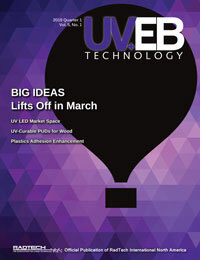 UV LED also eliminates the costs generated by cooling air blowers, ozone extraction and heat makeup systems. For more information, visit www.fujifilmusa.com/northamerica.